Chile copper developer Hot Chili (ASX: HCH) has added a further high-grade exploration target to its big Region III portfolio. The company has a busy year coming up on the exploration front as it strives to add high-grade tonnes to its existing large Productora reserve base. Managing director Christian Easterday talks about the way forward. RESOURCEStocks: Christian, the Hot Chili consolidation strategy continues apace with your latest deal to acquire 90% of another highly prospective copper property, Valentina, near the company's Productora project. Like the other two new additions to the portfolio, San Antonio and Lulu, Valentina has had limited drilling and mining that has underlined its potential as an attractive copper exploration target. How does this one stack up next to the other two in what you're now calling the El Fuego project, in terms of the amount of historical work done and what this says about its grade and volume potential? 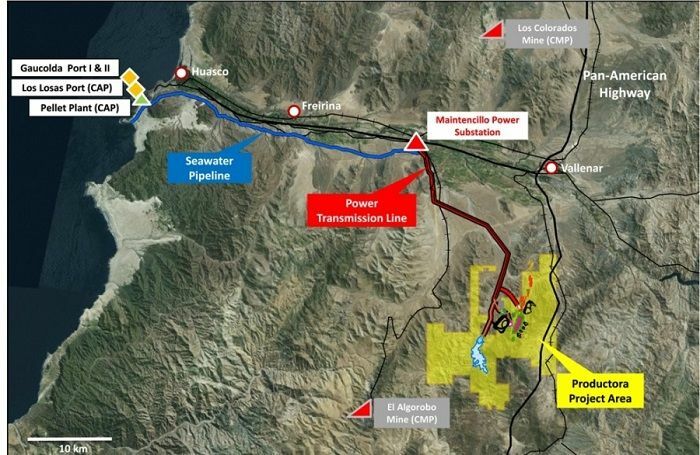 Christian Easterday: Yes, that's correct, Valentina contains a shallowly developed, high-grade underground copper mine exploited over a strike length of 200m. Near-surface sulphide copper mineralisation, comprising chalcopyrite and bornite, is currently being transported by lease miners to the state-run ENAMI processing facility. Several significant historical drilling intersections remain untested, including an end-of-hole intercept of 11m grading 2% copper (including 7m grading 2.7% copper from 129m down-hole) and 3m grading 3.4% copper from 27m down-hole. The fact that these exciting copper grades intersected at such shallow depths have never been followed up is quite remarkable, and present a fantastic opportunity for Hot Chili to test - and if successful - rapidly establish a significant high grade copper resource. Hot Chili has recently confirmed over 700m of mineralised strike length potential from surface mapping and sampling at Valentina, with the near mine- and mine extension areas representing wide, high grade target potential which features prominently in the El Fuego line-up of priority targets for drill testing. RS: Why add a third new property - what do you mean when you say the latest deal adds "critical mass" for Hot Chili? CE: It's all about probability of success. We now have over 2.5km of combined mineralised strike extent at El Fuego (which comprises the San Antonio, Valentina and Lulu landholdings), featuring underground mines and drill intercepts which have never been followed up. The addition of Valentina complements an exciting line-up of potentially significant discovery opportunities. RS: What, briefly, is the background to the Valentina deal in terms of past ownership and the factors that have effectively stopped it from being subjected to modern exploration? CE: Strong local partnerships have enabled Hot Chili to enter into low cost option agreements for what are effectively stranded assets, which contain or are adjacent to operating high grade underground copper mines. Current mining at El Fuego is restricted to ore processing at the small state-run ENAMI processing facility, making Hot Chili the partner of choice for private landholders in the region, given its goal to establish a major new coastal copper mining centre in Chile. The lack of modern exploration at Valentina is a primarily a function of its private ownership for several generations. RS: So now you've got more on your plate, from an exploration perspective. The company recently raised some equity funding. Last year saw you successfully clear the financial decks for a new phase of corporate and project development. What are the primary objectives, on the exploration front, for the next few months? CE: The San Antonio copper mine area is shaping as a focus for planned initial drilling following recent news of high grade (plus-5%) copper being extracted by lease miners from shallow (12-15m below surface) exploratory development 300m south of the existing mine. To have confirmation of such high grade material at such a shallow depth is almost unheard of in this business. Detailed exploration mapping has outlined compelling characteristics of a potentially large-scale deposit setting, with previous drilling largely ineffective, rendering the majority of the deposit untested. In addition, results are soon to be released on a soil sampling campaign recently completed across the southern extent of San Antonio, aiming to confirm and refine four plus-1km long copper soil geochemical anomalies. RS: What is your assessment of what the market wants to see unfold at Productora-El Fuego in 2018? CE: I suspect that the market will be very pleased to see drilling results that confirm the high-grade copper potential which we believe exists at El Fuego. Identification of shallow, high grade copper through drilling, with the ability to delineate copper resources of substantial scale would be a big tick for our shareholders and the market. RS: How is significant exploration success at El Fuego, particularly in view of the grade potential evidenced by previous mining and drilling, going to differentiate the Hot Chili value case in the market? CE: There is a saying in the Australian market that "grade is king", well in the Chilean market, "size is king". Having exposure to both grade and size, and projects that are all about location, location, location will certainly differentiate Hot Chili from the rest.